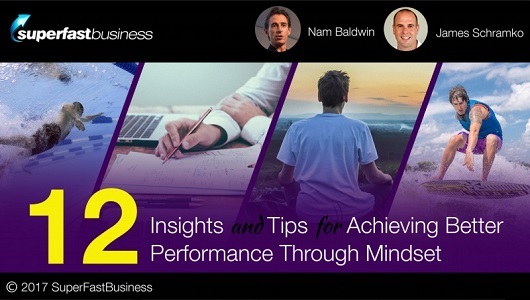 Nam Baldwin shares how he trains world-class athletes to excel in their fields, helping them realize the potential of their bodily skills - with the power of the mind. 05:35 – Can you be guided? 32:56 – Do you want to be in, or out? James: James Schramko here. Welcome back to SuperFastBusiness.com. Today, I’m speaking with an expert in mindset. His name is Nam Baldwin from Equalize.com.au. Welcome to the call. Nam: Thanks, James. Great to be here. James: Now, we have a mutual friend. Someone who’s been on a previous episode or two on SuperFastBusiness, Brenton Ford. He’s a swim coach, and he introduced us. Nam: Yeah, great guy. I’ve been doing a session with him not so long ago. James: I’ve been working with Brenton for many years. It’s been fun for me to get an insight into his world because as we get to develop products and look at how we package his business and sell training workshops, it’s been interesting just to develop an understanding of things like paddling technique, breathing technique, and as someone who’s taken up surfing in the last few years, I’ve been more and more interested in that. I’ve often wondered how some large, old dude can just paddle straight around me on a tiny, little shortboard when I’m struggling to make it out to the back, especially a year or two ago when I was on those Mini Mals as my training. It seems that there can be quite different results gotten from just changing the way that you do things and especially the way that you think about things. Would you say that’s true? Nam: Oh absolutely. Thoughts create feelings and feelings create the way in which we perform. The better the state, the better the feeling that we have within us, the better we allow ourselves to tap into the potential that we have. James: So let’s talk about the things that you’ve been focusing on. From what I’ve read, you are an emotional and stress-control management specialist. You especially help people with breathing techniques. I noticed you help some big-wave riders and some Olympic kayak gold medalists, some footballers and even a world-surfing champion, Mick Fanning. That piqued my interest tremendously because of course he’s so popular in Australia that even regular people would know who he is. They would have seen him on TV, especially yesterday because he announced he’s going back on tour, and he’s ready to take on another world title campaign. Have you been working with Mick? Nam: Yeah, we have. We started many, many years ago. We have been working very hard together the last couple of months, last three months actually when he got back from Europe. We knuckled down and went into the high-performance plan and really started the whole process. James: How much do you think has to be within the person in terms of their desire to move forward and their motivation? Like is it there originally or can you install it in someone or is it a matter of removing the obstacles that are holding people back? How do you approach this? Nam: It’s a little bit of both. But obviously, meaning is the biggest driver that we have – what things mean to us. That comes down to simple contemplation and reflection and looking at the world that you live in and how you can influence yourself through your thinking into having a greater meaning around something. That’s got to be a balance point too. You don’t want to get too overly serious on things because the more fun you have with training or business or setting goals like Mick is, the more fun we create within the experiences taking us closer towards our visions or goals, the better that we’ll perform. So it comes down to meaning – what does it mean to you, why are you doing this? And the greater the meaning and the more clarity you have behind why you’re doing it and the more that you visit that fairly consistent basis, the greater the desire will build. And in the end, that’s what we’re after, is emotional horsepower behind what we’re doing. James: That makes sense. Would you use a technique like the 5 Whys that Toyota use to uncover the meaning? Nam: Yeah, absolutely. You can use many different ways. But in the end, it will come down to your own meaning. The importance of it too is making sure that you know why, not because of someone else telling you why. But it has to be from within you. That can be just a simple, ‘Because I want to,’ or ‘Because I just love the whole experience of this process. Each part has an integral part to me.’ That can be as simple or as deep as you would like. But whatever resonates within you is important. James: So in terms of getting there, do you send Mick up to the top of a mountain? Like top of Dunbar [laughs] and sit there and contemplate? James: Or do you facilitate this? But you know, is it something you have to do by yourself or can you be guided through this? Nam: Yeah, you can be guided through it. In fact, sometimes it can help enormously if you get the right people around you to ask the right questions, because that’s what I believe performance and a greater life comes from is the right questions. So challenges are experience. If you’ve got the right questions, you’ll come up with the right solutions. And therefore, you can make simple quick progress in what you’re doing that will help you build more drive, more desire. So sometimes, you need to sit with someone and say, “Hey, I need to have a chat about this. Can you just be a lending ear?” That in itself from that perspective can create your own brain to go into gear by expressing it out verbally to someone. James: OK. This is fascinating to me. Just yesterday, I did an entire training on lifestyle design. One of the processes in that is when you’re got your different prototypes or your different ideas of paths that you can move forward with, the suggestion is to put your plans out there for your collaboration group to poke holes in and ask questions but not to create judgement. One of the techniques is to say, “Listen, I don’t want your opinion. I just want you to ask me more questions to help me refine this idea.” How important is that for you as a coach or a facilitator? Do you put an opinion in there, or do you just work with the material of the student? Nam: Yeah, I just keep asking questions. And the questions are there for the person involved to dig slightly deeper into their own conscious and subconscious minds to come up with what it is that they’re doing it for, the reason why. But the more I ask the questions, the more I can start to see, and then tell them, show them where their blockers are. James: So, you’re like a mirror that you’re holding up, reflecting to them. Nam: Yeah, pretty much. The more that we can discover our blockers, what blocks us from achieving things, the more that we will discover our movers, what moves us towards our visions and our goals. So we’ve got blockers and movers, and the concept is that through questioning and reflection, and again, getting to inconvenient truths, we can discover tremendous movers, that allow us to have massive changes in the way that we proactively take actions. James: So from your assessment, how deeply hidden are these inconvenient truths for most people walking around in society? Nam: Yeah. I think a lot of them may not be actually hidden. I think a lot of people are aware of them, but they just put them to the side because they don’t want to have an experience around themselves going, ‘Oh, I’ve just had this thought, and now it’s disrupting me.’ They cover it up, or they push it to the side, where I think a lot of it is evident but people just don’t want to go there, and that’s why it’s so good to have a coach is that we are there to allow them to see it in a way that is non-judgemental but just as information. It’s not personal. It’s just information. And having coming from that perspective creates a tremendous opening for the person to change and to thrive. James: So you must witness people literally breaking themselves down and sometimes probably just getting right to the raw bottom. It could be extremely emotional for that subject. And then I guess, you then help them rebuild back up. Is that how it works? Nam: Absolutely. Just taking it one step at a time, where again, when you get clarity around things, whether it be inconvenient or not, that clarity with the right questioning, with the right solutions put in place can be incredibly powerful. So even if it is a major challenge to a person, when you discuss it, review it, reflect upon it, and decide how it’s going to assist, some of the worst case scenarios can be the best case scenario because of how then we are removing blockers and we create this tremendous movement in what we do. James: Right. It sounds like you’re saying that an experience can be informing us. It can create a learning opportunity for us. Like for example, if we have a big wave hold-down, we get stuck underneath, we have an experience where we want to come to the surface and we feel like we’re in trouble and just can’t come soon enough, then we could take that experience and it could become a mover for us to educate ourselves better or do some more in-pool training and build up our confidence around that area. Nam: Absolutely. I believe that growth in anything comes from challenge and support. So what you just said there is you get challenged by a hold-down, but then you support yourself through that occurrence occurring again by going, ‘OK. I got to train for this. I’ve got to think about how I’m thinking when I go into bigger surf and get my mindset right. Get my physical body right.’ And have those things in place. But it will only come potentially for some by having a challenging experience confront them. James: Why is it that some people are able to proactively support themselves without needing that experience? Can you succeed without experience? Nam: Very interesting question. I think, whether it’s their upbringing and they’ve got a greater sense of what it takes to be successful or what it takes to have greater fulfillment. It’s an art and it’s a science. To be able to tap into those realms, again, it comes down to meaning. You’ve got to have a great meaning behind doing what you’re doing. Some people really do, and therefore, they will look outside the box and go, ‘OK. What else do I need to assist me through this?’ Because the greater the support and the greater the challenge, the more growth we will have. But those things need to be in balance. So if you’re going to challenge yourself and set big goals, big targets, you need good support systems in the background, both for yourself and the people that you work with. If that’s continually coming through, through you observing what is required, how would you do that, what it might be, look who else has done similar to what you want to achieve, and then can you just copy them? Don’t try and reinvent the wheel. That then allows you to have good supporting mechanisms in place. And the challenge itself is creating the drive. The two will work so well together. James: So in a physical sport, or what appears to be physical, how important is the mental side of it in say, going on a world surfing tour? Nam: Sometimes I say, the mind is the athlete. In terms of, yes, you need the physicality, you need the skill, but then you need the hardware upstairs to be able to work those concepts, those attributes that you have in a way where you are allowing your body to perform because your mind is clear. If your mind is wrapped up in emotion, that isn’t good for you. If you’re too anxious, if you’re too confident, those things can now limit the potential of how your body can operate. So the mental side of training now is becoming a very, very big part of the athlete world. It’s as important, and I believe that for so many decades, it’s been lost or not used effectively. And you can have potentially the greatest athlete of all time going to a competition, they bow out early, it’s not because of their physicality, it’s because their mind isn’t in the right place or they’re allowing thoughts and feelings to come into their experience that limits how they use their skill. James: I noticed now when we see telecasts of big competitions, we’re often seeing their coach getting a fair bit of airplay, and world title champions are often crediting their coach who they’ve done all the work with. And you can tell from the interviews that they’ve got new word tracks that have been added to their repertoire. There’s lots of sports sayings when you see the interviews, but the ones who are doing mindset work, you can tell from the words they’re saying, the way they’re reflecting on a heat where they may not have got the result that they were after, or they maybe come second in the entire competition, but they’ll still turn that into a positive, saying that they feel now they’ve got lots of great experience to go into the next round with, that they’ve had a good warm up. Nam: For many years, in the surfing world, it wasn’t really there at all. They just went out and surfed. But now, it’s becoming quite an important part of the process because the skill of all the athletes is getting greater and greater due to their physical training. But now, they’re also realizing that a huge part of it is the mental aspect. Can they regulate their thoughts and feelings so that then when they’re out there, they’re allowing their body and their skill to come through? Which doesn’t and shouldn’t require thinking. It should just be purely going into action. However, in that experience that they go through, obviously under the pressure, under the lights, under the scoring, under the judging, you’re going to have emotions that will rise. And when emotions rise, the thoughts tend to go obviously into your head, which then creates a deeper level of thinking or a very active level of thinking that then can minimize the way in which you perform. You get stuck on thought, or you get stuck on a tangent of thought, which then creates a slight delay in how you respond to an action or a process that you need to follow through with. Here comes a wave, they get stuck in the thought and allow that to consume them for a split second too long, and then timing is out. When it comes to motor control, motor function, it’s so much about allowing your body and mind to utilize or to use the skill that has been built to practice through continual practice. But as soon as he starts to think about things, in terms of when we go into a deliberate skill or action, if we overthink it, the motor cortex gets bound up and has limited ability to tap into itself to fire neurons through the body to then have that massively quick reaction speed that we require to do a maneuver. So overthinking, parts of the brain then are being used that doesn’t allow the motor cortex to fire as quick as it can and then the information is a split-second too late. Motor skill is lost slightly, and we dig a rail, or we do something that isn’t in alignment with the performance that we would like and an action that we are trying to create. So by self regulating our thinking, by having a simple mantra that you have in your head, “Relax, flow,” you’re reminding yourself and your brain what it is that you’re trying to create within the body to allow the performance to thrive. And if we’re not practiced in that, the emotion becomes too much. It rises, we feel it in the body, and then we lose our centeredness. We lose the ability to stay centered, which allows us to use our body in a very, very high-performing level. James: Is this what some people call flow? Nam: Yeah, absolutely. 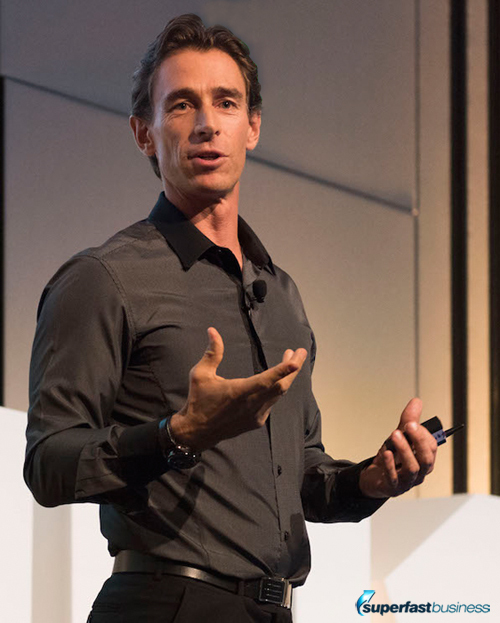 You’ve got this whole neuro scientific concept around how do we get better performance? We have to go into flow. Here’s the first part, here’s the secret to going into flow – you need to go into struggle first to get the brain to go into flow. What does that mean? A really good warm up creates a struggle, where your body goes into this oxygen debt, carbon dioxide excess, you feel a bit of lactic, and in that process of going through a really good warm up and getting your breathing rate up, your muscles functioning on a high level, the brain is then perceiving, ‘Oh OK. We better go into greater secretion of specific chemicals that will allow now the entire body and mind to work together,’ where thinking becomes more feeling, and you get this incredible experience of what we call flow, where you can do things in a split second. A split-second reaction that takes place in your mind and your body based on the fact that you went into a slight struggle that created this stimulus of the brain having to kick out endorphins, kick out nitric oxide, kick out dopamine, norepinephrine. All these chemicals that allow now the body and the mind to unify and to have very, very fast processing capacity that allows this experience of flow. James: So is that basically using like a contrasting technique to trigger the fight-or-flight reaction? Nam: Yeah. You’re stimulating the nervous system. But in that process of a good warm up, you’re observing, acknowledging the experiences of the struggle so to speak. So therefore, you have an awareness of what’s going on, which then allows a regulation of that fight-or-flight response because you don’t want to get too stimulated, too sympathetic. You want to create a bit of a struggle, but it’s regulated so that you don’t dip potentially if you’re a rookie into, ‘Oh, I’m feeling a little bit puffed. Maybe I’m not doing it right.’ And then you go into a form of anxiety or fear. You want to keep that regulated. James: You see all the athletes wearing headphones and using exercise machines and stuff. What are they playing on these headphones before a heat? Nam: It could be a number of things. I’ve asked lots of them. It could be a song that they have that’s upbeat, and therefore, it’s stimulating them. It could be just a music soundtrack. So just music, not words, that create the same effect. But generally, it will be music that creates an upbeat experience within their brain. Why would you do that by the way? Well, music has been proven to stimulate your dopamine receptors, which is then obviously allowing dopamine to be secreted, which increases your pleasure, increases your focus, and allows you to be stimulated in a positive way. Or it could be that they have a voiceover that says, “Now, I want you to think of this particular thing.” And they’re using that as a guide to keep them centered, to keep them on task. James: How many people are using particular anchors like that that are not maybe observable by the public? For example, an experiment that I did is when my coach told me to use the same board as often as possible so that I could really dial in my skills on that board. I’d mark the board each time I surfed it, and I started creating this sort of trail all the way up the nose, got up to 20 times, 24 times I’d surfed that board. And when the waves got a bit bigger and a bit scarier, I would just look at the notches, the little marks on the board, and I’d be able to just let go and think, I’m really confident with this board because I’ve surfed it two dozen times. I know the board, the board knows me. It helped me paddle into the waves. Do they do things like that? I noticed a lot of them draw on their boards, and they’ve got magic boards, and special boards, and I’m sure they probably have favorite Speedos they wear underneath their wet suit. Nam: The challenge I guess is if the board breaks. James: [laughs] Yeah. And it does, doesn’t it? Nam: Ideally, you have those anchors within your own physicality. So it might be a stamp of a foot, it might be click of the fingers, it might be rubbing the hands together. There’s so many of them. But you’re absolutely there. They’re now understanding, and with business too, we all have anchors and triggers that we are firing continuously during the day. Again, the better ones, better performers will acknowledge and tap into the ones that really enhance their performance. I’ve got many anchors that I use during the day that creates a state change with a trigger. So that then I can get into state because that’s so much around performance and how we perform or what’s your ideal performance state. Once you get real clarity around that and clear of what that state may be, and then use an anchor to trigger it into action, you can be anywhere and any point and have that anchor fired, and now you’re going to physiologically change how you think and feel into the right state. James: I love that. Yes, I use lots of anchors, too. For example, my first thing in the morning, I’ll have a bulletproof coffee and a big glass of water, and I just go into super productivity mode. When I’m writing, I put on headphones with some dance type music, like a Ministry of Sound loop or something, and I just, I almost turn into a machine. I could just block the world out, put the airplane mode on the phone. In terms of negative anchors, I think a lot of people in the business world are negatively anchored by Facebook message beeps and dings, and they’re constantly getting that little dopamine reaction requirement to attend – who’s tagging me, what’s that message? And they’re constantly just on/off, on/off, not able to focus or concentrate or anything. So I think putting the blinkers on or the blinds on like those headphones, I imagine some people take it to the next level. Does anyone use eye masks or just shut out all senses except for just the sound? So you’re pre-empting what may get in the way. Have the solutions ready. So that when you hit blockers, you’re ready to move through. I think that’s a major concept for goal setting in business and in sports. When you set the goal, well done. That’s wonderful. Now first thing, what’s going to get in your way? Because there’s so many goal setting concepts out there that I believe miss out this one important factor – they miss out – hang on, before we begin, why don’t we just put down in bullet form what’s going to get in the way of our achievement of this goal? Then, what’s the solution? How do we get around these blockers? Then, what’s the process? What’s the first thing that we need to start with? First things first. That way, you’re allowing yourself to minimize the threats. ‘Today, I’ve got a lot of work to do. What’s going to get in the way? OK. My iPhone keeps beeping at me to tell me I’ve got a link or a like or whatever it may be. So I need to put that away.’ But you did that before you started the day. So you start to build now processes within your own working mechanism of how you obtain goals and visions, etc. that you can then record and find out the recipes of what works for your high performance. And the more that you sit, and work, and contemplate on those things, the more that you are sending upstairs to your brain, which is a recording device. You’re sending information within it, we’re not sending it to your experience within the brain, what is working for you, what gets in the way, what are your distractions? James: So that’s why it’s good to do your work while you’ve got the maximum amount of willpower in the beginning. Nam: Correct. And get yourself in the right state before you start, whatever that state may be. James: Very good. I’m curious. One thing that affects business owners and definitely athletes is like, think of it in terms of Mick Fanning, he’s travelling around on a tour with all the very, very best surfers. Everywhere he goes, the very, very best surfers are there in the same room, some of them are sharing the Rip Curl house, team mates, but then they have to compete with each other. In the business version of that, we’re out there, we’re doing our marketing, and then we see another business person. They publish their book, or they put out a new course, or they’re running a great event, or they’ve got something big. It can really take the wind out of your sails. If you’re an athlete and you see someone post a 10 out of 10 score, and you’re in the same heat, how do you protect yourself, or partition, or what techniques can we use to keep our own strength and to hang on to that emotional horsepower? Nam: Well first of all, when you get that type of experience, is to just sit with it and to decide, what is the emotional experience you’re having here? And you’ll find that when these little threats come in, all t is is just your emotional brain starts to kick into gear, predominantly because your ego has been threatened. In the end, it’s almost saying, are you good enough? Now the more that you focus on that, the more that that will build and the more that you’ll think that you’re not. So if you can just sit with that and then have an acronym such as keep it NEAT, NEAT being the acronym. It’s normal that you’re going to have a little bit of a rise in emotion when what you just said is happening in your experience. In fact, expect it. So Normal, Expect it. Then just Accept it that that is what may happen from time to time. But then Tidy it up. Don’t dwell. Review, but don’t dwell. Because if you dwell on it, you’re just building the same pattern that will then become a habit every time it happens. So once it happens, OK, well that’s great. Wonderful. They’ve done well. Now, keep your attention on your strengths. Keep your attention on what you’re proactively doing and trying to achieve. Come back to your space. Come back to your world. Stop jumping into other people’s. You can then use that though as drivers. Look what they’re doing. This is wonderful. If they can do it, it means I can do it. So let’s just continue on the process. James: That strikes a chord with me because one of the significant reason that I ventured down the online path was that at the very early stages of me exploring how I might go about building a website, somebody sold a million dollars’ worth of stuff in just one day, in fact, about 16 hours. I’m like, ‘Wow, that’s pretty exciting to think someone can do that.’ Because if he can do it, then perhaps I could do it. And that was a positive benchmark. James: I was having dinner with that guy just like a week ago. And this is like 11 years down the track, 12 years. I was just letting him know how it was interesting that his event triggered a lot of events for me. And then when our peers, we go fishing together and stuff, and it’s just great to use positive experiences like that. I guess you can make a choice. Am I going to let this drive me down, or am I going to let this lift me up? Nam: Exactly. And it comes down to focus again and where you put your attention. So it’s about putting your attention on your strengths. Putting your attention on the fact that someone else has done it. That means you can do it. And then going back to process. Is there things that we can refine, make a little better so that we are going closer and closer to our visions? It just takes a bit of reflection sometimes. Not dwelling but reflecting. Where can we improve? Where’s the gap of where we are, where we want to be? Can we bridge that gap a little quicker? And it’s just those simple questions again that we spoke about in the beginning of the podcast. It’s questioning. It’s coming down to simple questions. Where’s the gap? How do we fill it? Are we in the right state? Have we reviewed and reflected this week and looked back on things? Have we done the correct sequence of things? Where is our attention going? Is it on us, or is it on our competitors? Let’s put it back on us because the more we have attention on ourselves in the process that we’re doing, the more that we will have the energy within that experience that then allows the magic to happen. James: So when you have this huge audience and the very public things going on, like the whole world saw a huge, great white shark fin circling around Mick, and then he had some family situations happen that were probably a very high emotional load on the scale of things that can happen to a person. How do you decide whether you want to be in or out? When you’ve got all this weight of the public attention, how do you get back into yourself and decide what it means to you, and how do you filter out? Are you doing this because the public wants it or are you doing this because your mom wants it? Are you doing it because of ego? Or are you doing it because you don’t know anything else? Where do you start even making those potential decisions? Nam: Well, initially, you can think, OK, he was a high-profile guy already before that happened. So your beliefs are a big part of this. You could have the belief – alright, whatever happens, use it. So this experience happened. Now, we have a choice. Do we want to bury it, or do we want to use it in a proactive way that can now enhance other people’s lives? Because it almost took yours away. So let’s see if we can enhance other people’s lives. How about we give back more now? How about we show people more compassion? How about we work on aspects of ourselves that allows us to go, ‘You know what, I am so grateful and lucky that that didn’t go the way it could’ve gone. So now, I’d better fulfill what it is that I’d like from life.’ And that, to him, at this point, has grown into contribution, to giving back. And then comes choices, how to use it. And that will come from contemplation, reflection, chatting to potentially – let’s call them the board of directors of your group – that allow you to have great discussions, deeper, meaningful discussions with end goals in mind, which might be in the end, let’s just give back. Let’s contribute. Let’s think about growth. How can we grow from this experience? And again, it’s questions that will provoke higher levels of thinking. And now, that experience, although it was tragic in many aspects, is now powerful. James: That’s great. I love that. Whatever happens, use it. And then how do you use it? James: How do you select a board of directors that are positive? Because especially for entrepreneurs, partners sometimes don’t understand the whole running-your-own-business thing, especially in the beginning when you’re spending money and not making money. We’ve all been conditioned that we should go to school, go to university, get a job, and be a good provider. This whole entrepreneur thing seems somewhat sketchy to parents and partners. How do we get that board of directors who are going to support us, but at the same time, how do we know we’re not just being completely reckless and unrealistic? Now obviously, there’s an element within that that some people may be taking too much risk. But again, that’s why it comes down to contemplation, thinking and then talking to people who are experienced in a similar way that you are now going through. That may take searching out people. It may take searching out a coach. Going and chatting with individuals and listening. Listening to what they say so that you can get the evidence that will help support your vision, your goal. How do you pick these board of directors? You just need to be very aware of those in the game that you’re in or similar to it, and try and make contact. Try and meet up. Try and have a little 30-minute discussion around what is it that they found challenging. How did they break through? So that then when you take that leap, you’ve got a bit of evidence to suggest, if I follow the process, there’s a good chance I’m going to get the outcome. James: I love that. I mean that’s why you’re here Nam. We want to find out the process to think better because as you said, you can regulate yourself and the way that you think and the way that you feel. And in terms of designing your life, I came across a really similar example. They suggest you do interviews or get work experience in something that you’re thinking you might want to do first. And they recommend you score or rate your prototypes according to available resources, how much you like it or are drawn to it, how confident are you that you could do it, and how coherent is it? I think that’s the check filter there. For example, if I want to go on tour and be the world surfing champion at age 45, having just started surfing three years ago, I might score well on resources. I might really like the idea of it. But my confidence would be fairly low, especially after having paddled out at Snapper once and witnessed Mick Fanning right there next to me swivel around on what looked to me like quite the close out and just fly off down into some barrel. Coherence, I’d have to say I’m completely incoherent if I’m thinking I’m going to be the world surfing champion. And if I hung out with a few good surfers, which I managed to do the last week when they invaded our beach here, I was surfing with a hundred pros every session. The difference between what they do and what I do in the same waves, that is enough for me to know that sadly, a world championship title is probably beyond my grasp. James: However, I’m happy to hang out with them, take some pictures and keep developing a great media channel for them to be able to express themselves and create value for their sponsors and so forth. James: So let’s just have a little recap here now. I want to see if I’ve been paying attention. With the things that we’ve talked about, we know that growth comes from support. We should be asking the right questions and looking for those inconvenient truths. A lot of this revolves around meaning. And if we can develop fun through our contemplations and uncover real desire, then we’re going to build up our emotional horsepower. We know that there’s blockers and movers. So our questioning should really seek to uncover those blockers and we can turn some of those things into movers, especially if we have experiences that might not be perfect for us, we just take this attitude of ‘whatever happens, we’ll use it.’ We figure out how to use it. We consult with our board of directors and we talk to people with real experience. We just let things sit with us a bit and think about it. We have a NEAT approach. We know that it’s normal, that we expect these things to happen. We accept it and then we tidy up. Nam: We’re on track, yeah. And the whole concept again is you need the right state for what you are going into on a continual basis because your performance is based around the state that you’re within yourself. The emotional experience you’re having at the time. If you have hunger, if you have desire, you’ll have great drive in what you’re doing. If you’re bored, if you’re tired, etc., it will limit how well your brain functions. James: Yes. And we should single-task and have a struggle warm up. Nam: Yeah. Get into flow. Do a little morning ritual, a miracle morning ritual where you wake up, you hydrate, you oxygenate, you invigorate, and then you anticipate your day so that then you’re pre-empting. By the way, what’s going to get in the way? Not by the way, what do you really want to happen? That’s wonderful. But actually, why don’t we think about this – what’s going to get in our way? Let’s quickly make a solution checklist so that we can tap into those solutions to minimize the problems occurring when they do occur, because they will. That’s all part of the game. James: It is. It’s normal, isn’t it, Nam? Nam: Yeah. So the more that we pre-empt, the more the brain will then come up with solutions because that’s what it predominantly should be driven to do. Solution-focused, not problem-focused. James: Right. Wherever we put our attention is what we’re going to attract, right? James: So this has been great. We should develop our anchors. If we’ve been listening to this, we’ve got a feel for it, Nam, you’ve got some material that we could have a look at. Your website is Equalize.com.au. Why don’t you tell us about how you help people who might get some value from that or what we could explore next. Nam: Yeah, absolutely. There’s a couple of aspects or areas that I really thrive in. One is, in this emotional-intelligence realm in relation to discovering more about yourself and the potential within you through very simple recipes, rituals and goal setting that will allow you to obtain the goals, the visions that you may have, and just breaking that down into simplicity so that you have a very, very simple and very easily applicable process to breaking through challenges and to setting things up so that you have the ability to follow through and be proactive. That is the realm that I’m loving. And also, obviously, in the performance from an athlete’s perspective, it’s still mental and emotional, but I’m bringing in a breathing aspect to that because I believe that for athletes in particular, and for anyone actually, breathing is the foundation to everything because the better you breathe, the better your heart beats. James: Most people I know do it. Big fan of breathing. Nam: Yeah. The better your heart beats, the better your brain functions. But the thing is that people don’t realize it. Their breathing potentially is not assisting them to how it should be. Yes, they’re alive and they’re doing things. But you can really benefit from better breathing. And that’s where I come in as well is to teach about the physiology behind the workings of your nervous system and your brain. James: Where do we get that? Nam: That’s on a similar website. There’s a website called BetTraining.com, which is a breathing program website that we’ve put together that is predominantly for surfers but we do it for all athletes now. I’m working with a number of different teams, and Olympians, and world champions in relation to how they’re breathing in their training and how that links to mental and physical control. James: Well, thank you, Nam. We’ll link to that in our show notes. Nam Baldwin from Equalize.com.au. Thank you for sharing this information with us. It’s just really good to get behind the scenes and find out what’s really going on. Hopefully as a result of listening to this podcast episode, we’ve set some anchors, we’ve got a great attitude for moving forward in our business or our athletic career, and we’re going to have a great life. Thank you! Nam: Thank you, James! Really appreciate it.